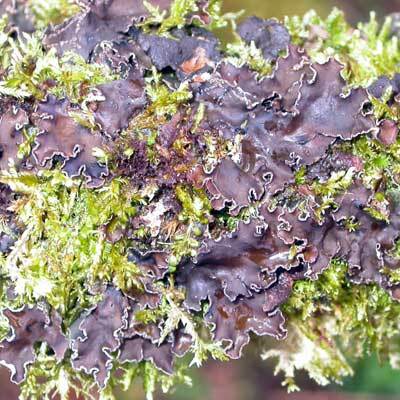 This is among the prettiest of the foliose lichens, similar according to some authorities, to N. laevigatum (described elsewhere), yet I think aesthetically it resonates best alongside Sticta and Pseudocyphellaria. Its uneven rosettes (to 10cm diam.) 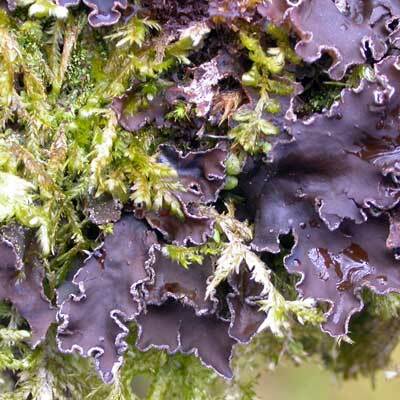 of grey to dark red-brown shiny lobes are trimmed with marginal soredia as in Peltigera collina which then spread onto the surface as tiny blue-grey spots, a little paler than the lobes. The bare undersides and white medulla distinguish it clearly. This mix of characters adds a touch of the exotic, especially when found in old growth woodland or along the wooded valleys of the uplands. Northern and western Ireland. 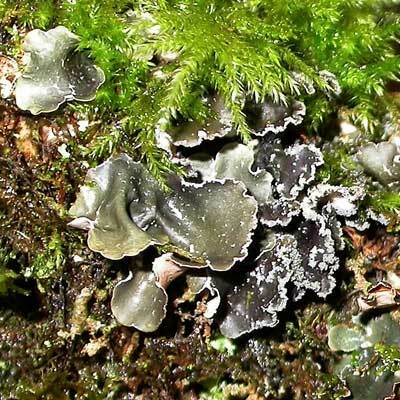 The naked underside without root-like structures (rhizines), furriness (tomentum), or spots (cyphellae) and the presence of a white medulla is diagnostic. Simms, M. J., (2016). Nephroma parile (Ach.) Ach.. [In] LichenIreland.